Carowinds’ Education Days align with North Carolina, South Carolina and Georgia Standard Courses of Study as well as National Science Standards. Carowinds partners with leaders in interactive education, to deliver an impactful, one-two punch of hands-on STEM learning and action-packed fun. We are thrilled to introduce our new 2019 partner, Thinking Feet! Thinking Feet is Charlotte’s premiere STEM enrichment provider to students from elementary through high school. An organization founded by STEM professionals, Thinking Feet serves hundreds of students across greater Charlotte in Technology, Science & Engineering, Math Problem Solving and Creative Writing. A trusted enrichment partner for many public and private schools, Thinking Feet’s programs are uniquely designed to develop creative thinking and problem solving aptitude in students of all age groups. We are also excited to announce the addition of a teacher’s lounge this year! See below for additional information. To help you make the most of your day with your students, Carowinds offers these free downloadable, age-appropriate workbooks for every grade level. Download yours now! Enjoy a buffet of Fried Chicken, Hot Dogs, Mac & Cheese, Salad, Corn, Potato Chips, Chocolate Chip Cookies, and Soft Drinks. 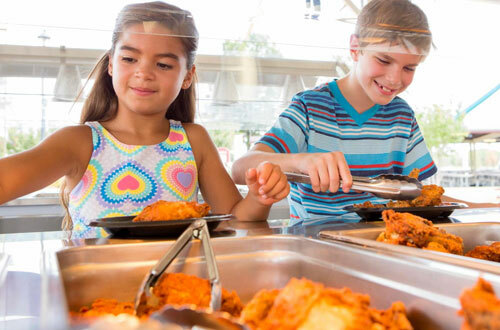 Add a full day of free refills on drinks to a buffet of Fried Chicken, Hot Dogs, Mac & Cheese, Salad, Corn, Potato Chips, Chocolate Chip Cookies and Soft Drinks. 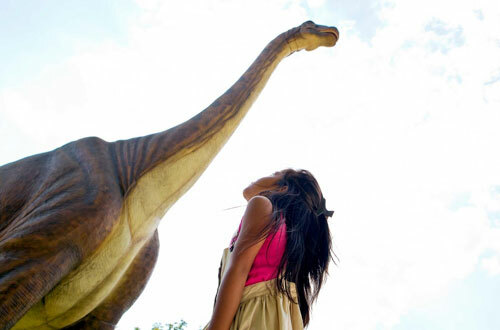 Combining finely detailed hand-crafted animatronics, interactive consoles, a lush setting and educational content that reflect the latest scientific theories, Dinosaurs Alive! gives students a rare chance to walk among these awe-inspiring beasts and actively engage in a unique learning experience. 8:30 – Parking is open and you may come into the front gate. If students have any season passes that need to be processed, they must be processed before park entry so this is the perfect time to take care of that. 9:00-1:00 – The 4 stations are open. This year we will be doing a passport program. Your students can pick the passport up at the first station when you enter the park. They will have the passport stamped at each station and at the end of the day turn them back in to that first station for a prize! Below are the 4 stations and where they are located. Station 1: Celebration Plaza! Start your day here. Pick up your passport to learning and get started on your journey! Make your own tracks of our new coaster, Copperhead Strike, using electromagnetic forces to get your roller coaster shooting through the tracks. Plus, understand the physics behind non Newtonian fluids and their fascinating characteristics that change when force is applied. Maybe this will give you some ideas to design the roller coaster tracks of the future!! Station 2: Camp Snoopy – Ozo-coasters! You will be greeted by our tiny robots called Ozobots. Design colorful coaster tracks and use color codes to take Ozobots on loops and turns and make them twist and dance for you along the way. These robots are programmable and can read color codes. A fascinating experience in coding and robotics awaits you as you custom code these tiny, yet powerful, robots to obey your every command!!! Prepare to be fascinated. Next, build a flood warning system to stop the roller coaster on its tracks to keep the riders safe. Build an electronic circuit based flood warning system that will stop a roller coaster moving on a computer screen. That's right; the circuit you will build will magically interact with your computer to stop a moving 'virtual' roller coaster!! Station 3: Crossroads, near Dodge-Ems! Here you will be greeted by our Lego Mindstorm Robots. Program them to move around, avoiding obstacles along the way. Today sensors are everywhere from your home thermostat to Tesla's self-driving cars. Watch sensors in action as they sense obstacles and colors as they move. These robots can be programmed to react to the sensors and do amazing things!! Then, move a coaster-marble from start to finish using wooden blocks and tracks and fidget spinners to introduce twists and spin along the way. Bring your unbridled creativity to life in this free form experiment and learn about the relationships between kinetic energy and potential energy! Station 4: Coca-Cola Marketplace near Drop Tower – Engineer your Coaster! Build a fully functioning coaster with tracks, loops, cars and see it in action. Challenge your coaster to reach new heights and figure out the height of drop needed to achieve those heights. Nonstop twisty, loopy fun awaits!!! Build a virtual coaster! Design your own virtual roller coaster with all the bells and whistles and see it in action. Add power lifts anywhere in the course to simulate the actions of the Copperhead Strike!! Challenge yourself to get in as many loops and turns as you can!! You may find yourself searching for more potential energy than you have. That's where the Copperhead Strike comes in with a second power push in the middle of the tracks!! You may be the one to build the roller coaster of the future!! 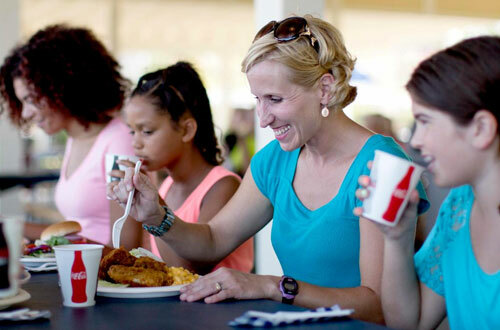 11:00-2:00 – Enjoy an all you can eat buffet in our Grove Picnic Pavilion! Tickets can be purchased via the order form for $13.99 per person and includes fried chicken tenders, hot dogs, mac & cheese, salad, chips, cookies and unlimited soft drinks! For an additional $6.51 add a bottomless soda wristband which will allow unlimited drinks all day long while in the park! We appreciate you and want to thank you for bringing your class to visit us for Education Days! Our teacher’s lounge will be available from 11-2 on Education Days and will be located in the Rose Room as you enter The Grove Picnic Pavilion. The Grove is located just to the left past the stroller rental near the front gate. The lounge will provide an air conditioned area to relax and cool off and will also include snacks for you. Just show your school ID at the entrance to The Grove to be admitted! All school checks will be processed through Telecheck for approval. If declined, another method of payment will be requested. Chaperones: one (1) chaperone admission ticket will be given for every fifteen (15) admission tickets purchased, unless otherwise noted. Complimentary chaperone tickets do not include picnic meal or bottomless soda wristbands.